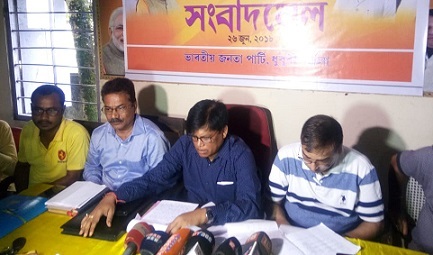 Bharatiya Janata Party (BJP) leader and Dhubri district’s Golakganj legislator Ashwini Ray Sarkar has strongly condemned the physical assault on the ‘deka satradhikar’ of historical Madhupur Satra located in Cooch Behar of West Bengal (WB) and alleged that Mamata Banerjee-led Government in WB has “totally failed in curbing anti-social activities in her State”. BJP MLA Sarkar said this while addressing a press conference along with other party leaders including Dipak Saha and Dr D Sanyal, district president and vice-president respectively at the party office located at Tetultala of Dhubri town on the occasion of completion of four years the BJP Government at Centre and two years at Dispur. Pitambar Bhakat, the ‘deka satradhikar’ of Madhupur Satra at Cooch Behar, was allegedly assaulted by one Mintu Roy on June 22, 2018. Bhakat, who sustained severe injuries, was immediately admitted to a hospital in Cooch Behar for treatment. Dhubri Deputy Commissioner Ananta Lal Gyani along with other district administrative officials rushed to the spot immediately on June 22 and took stock of the situation with their counterparts in Cooch Behar. The Asom Satra Mahasabha has also strongly protested against the physical assault on the ‘deka satradhikar’ of Madhupur Satra. Jitendra Nath Pradhani, Satradhikar Sri Sri Dham Ramraikuthi Satra Samiti (Satrasal) of Dhubri also visited the Madhupur Satra and condemned the incident. He demanded the authorities concerned to take strong action against the anti-social elements engaged in polluting the atmosphere. Later, the Cooch Behar Police arrested the accused, Mintu Roy and also registered a case against him. It may be mentioned that on December 17, 2016, Assam Chief Minister Sarbananda Sonowal also visited the Madhupur Satra after taking charge as the State’s Chief Minister and during his visit, he also took note of the security situation and urged the Superintendent of Police (SP) of Cooch Behar to provide security in the peripheral areas of the satra.